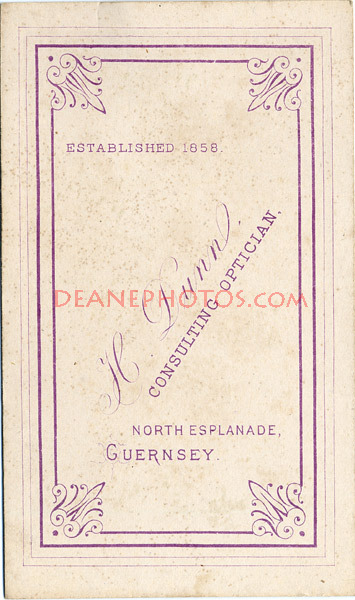 Henry H. Gayton (Born London Middlesex in1842) was an Englishman who came over to Guernsey in the 1870's (not showing on 1871 census) and based himself in Guernsey as a professional photographer. He was known to be operating from 50, Victoria Road, St Peter Port in about 1876 until approximately 1881 and then went to 5, Le Pollet, St Peter Port possibly until 1886 when James Burnside was known to be at that premises. On the 1891 Census, Henry is designated as being 49 Years old and living with his English born wife Olive aged 29 (Born 1862 in Croydon), and his Guernsey born daughter, Mary Gertrude aged 6 years old. Their abode at that date was Gordon Cottage, Fort Road, St Peter Port. Access to the 1881 Census has not been obtained to date, though he is believed to have been lodging at that time. There have been a number of photographers based at 5, Le Pollet over the years. Shown here are some examples of his work on carte de visites.